We turned east a couple days ago on I-40. We have a stop to make before we go home, which I will write about later. Route 40 just happens to take you through Memphis and in my opinion, when passing through Memphis one should consider a stop at Graceland. When I learned that Ben had never been there the stop became mandatory. We stayed at the Graceland RV park that happens to be at the end of Lonely Street behind the Heartbreak Hotel. I was worried it would be cheesey, but I pleasantly surprised. There was some obligatory cheesiness of course, but there is a beautiful park area next to the RV area; nearly two acres of old oak trees, grass, birds and Mother Nature. Ryder was in doggie heaven and rolled with joy on the cool grass. Hard to believe it exists in the middle of South Memphis, which is a neighborhood teetering on the edge of seedy. This was my second Graceland visit. On my first visit to the house, I noticed the things most people do; the decor, the records, and what I call the “Elvis-ness” of it all. At the iconic gates, bricks are covered in fan graffiti. Inside the gates and at the door of Graceland, a tour guide intones solemnly “This window (pointing to the second floor) is where Elvis’ bedroom is, and this (pointing to the next window) is the room where he died.” (They never say “bathroom,” which is what is behind the window) They admonish you to refrain from using flash photography, and to respect that this is still a home to the Presley family. After a third review of how to operate an iPad (lessons one and two happen at the visitor center and on the shuttle) you enter the house. At that point you are left alone with your iPad, headphones and thoughts. Perhaps it was because just before the Graceland stop we were in Santa Fe touring the churches, but I had the same feeling as I did visiting the churches, particularly the ones with their “verified relics;” little bits and pieces of saints encapsulated in glass. Even though I don’t put mystical stock in relics, when I am in front of them I do get that sense of being in the presence of something that is very precious indeed to true believers. As I wandered through Graceland listening to my iPad recorded tour and looking at these bits and pieces what was left of Elvis, I marveled. How was it that this man, this particular singer, had been canonized by his fans as had no one else? I wondered aloud to Ben if there was any other personality who has been similarly immortalized, and neither of us could come up with a name. Prince has (and deserves) sainthood potential, but only time will tell if this will come to pass. The King is the only one I can think of who has been immortalized in such a big way. Just like in church, both the faithful true believers and casual observers passed by each relic in quiet reflection. 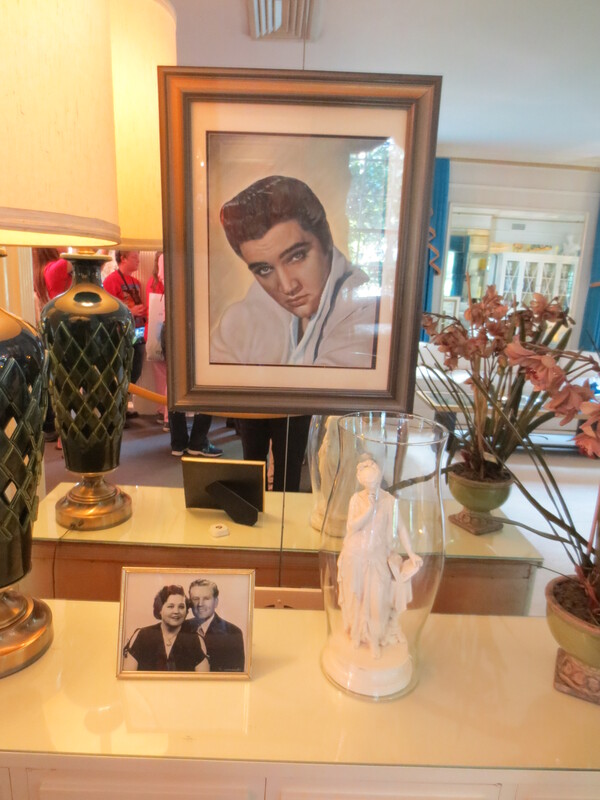 While there are only tiny bits of saints such as a bone fragment or a few strands of hair to view, Elvis’ relics take up four buildings, two museums and a jillion gift shops where the faithful can worship–and shop. Elvis and his parents, and an anonymous statuette. As a teenager I didn’t get Elvis. By the time I paid attention to such things his music was mostly played on “oldies” stations which we eschewed because our parents listened to them. Kids my age from Ohio and Michigan listed to “CKLW, Motor City” out of Windsor City (not Detroit as many believe, sorry folks!) on our tinny AM radios. Then the British Invasion came along, and Elvis seemed like a dinosaur. I was more into singing “Piece of My Heart” than “Hunk of Burning Love.” With his puffy face, bleary eyes and crazy outfits, he looked like a classic sell-out. Elvis disappeared off my radar in the Vegas years, surfacing only when he made a TV appearance. When he died, I was surprised by the magnitude of clamor and grief. Everyone mellows over time. My 23-year-old self couldn’t relate to Elvis as a performer, let alone as a human being. Now that I’m 63, it’s a different story. John Lennon was said to observe that “before Elvis, there was nothing.” I don’t believe that for a minute, but Elvis certainly brought forward music that many white kids in his fan base had never heard. I’ve become interested in his music as a part of a genre, and in him as a performer. I look at his early footage and see a clear eyed man in obviously in love with the music he made. In his early movies he looks as if he is having fun, but at some point his smile stops below his eyes and he looks bored. He has that same look on his face from time to time in his later performances. That’s sad to see; by all accounts he was a humble generous person with a huge appetite for all things in life–which likely contributed to his early demise. 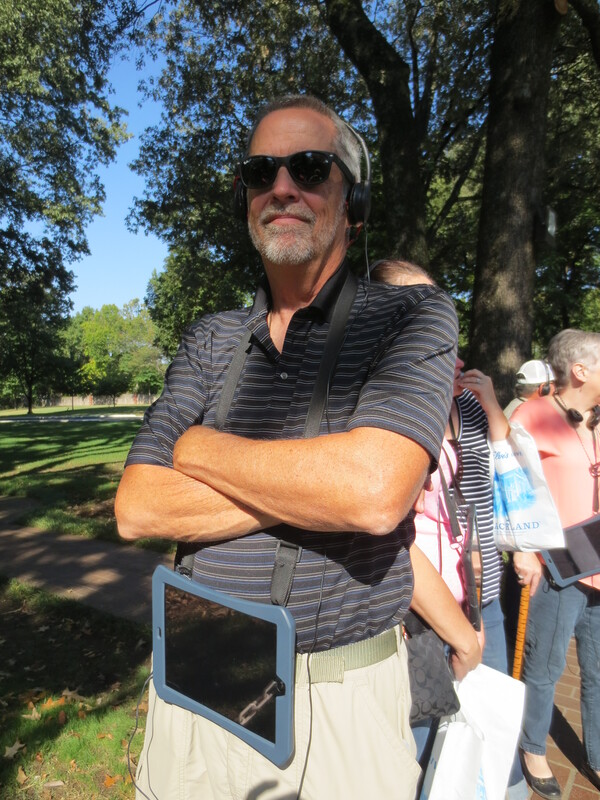 Graceland curators change up the exhibits and this time around his last few concert recordings were in heavy rotation throughout the house and complex. I do not care for them because the physical decline of his body is obvious and his voice is nearly shot. Still, he has that spark, that drive to perform that kept him going until the end. I respect those recordings but prefer his youth, grace and joy. 2017 will mark the 40th anniversary of his death. In this country we don’t remember many things for more than a news cycle, let alone 40 years, A new hotel and conference center next to Graceland is nearly completed, which makes me think they are preparing to capitalize on the faithful who will make the pilgrimage to South Memphis. 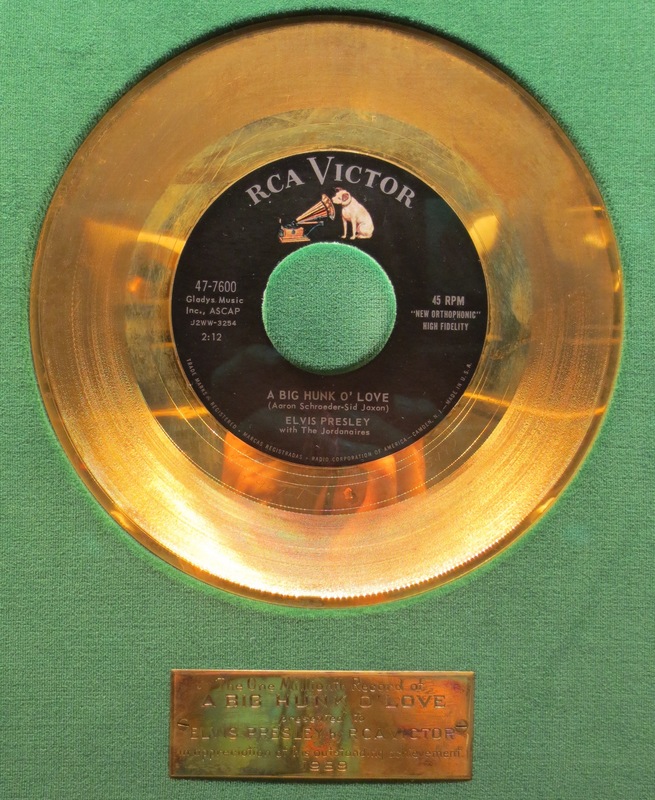 Elvis has been accorded a posthumous level of fame beyond any performer I can think of. His estate does a good job of keeping the myth alive and holding the interest of casual observers such as myself. Without true believers, any icon will fade over time. Judging by the lines at Graceland on a sunny Saturday afternoon, the shrine will be going strong for a while yet. A Big Hunk of Love from Elvis to you!